The SOLO 5RB-2050 5 oz. Bare Eco-Forward treated paper cone water cup is for use with cold liquids, is made from paperboard with 80% plant-based renewable resources, and is compostable in commercial composting facilities. The paperboard exterior of the cup is made from 80% fibers certified by the Forest Stewardship Council (FSC) as originating from sustainably managed forests, or by the Sustainable Forestry Initiative (SFI) as originating from legal and responsible sources. This product meets the D6868 standards of ASTM International, formerly known as the American Society for Testing and Materials, for being compostable in municipal and industrial composting facilities. It is also accepted by Cedar Grove composting facilities. 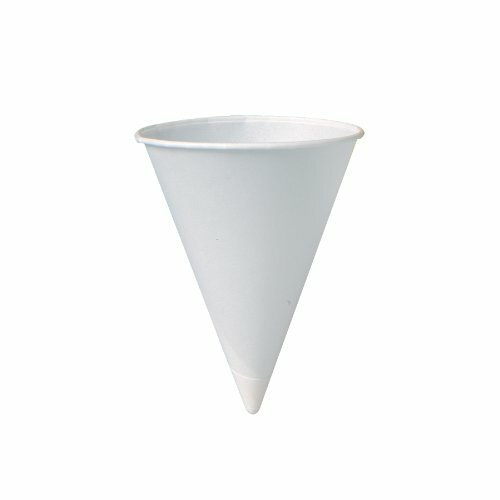 This cone cup has a capacity of 5 oz. and a white color. Cups are packed in plastic sleeves that each hold a pack of 200 cups. Each case contains 25 plastic sleeves. Disposable food service products are used to store, insulate, transport, prepare, and serve food and drink. They may be made of paper, plastics, or metal foil. Food service products for freezing items protect their contents from freezer burn, contamination, and drying. Microwavable food service products are safe for use to heat food in a microwave. Compostable food service products biodegrade about as fast as yard trimmings and food scraps, and disintegrate so that no large plastic fragments remain.